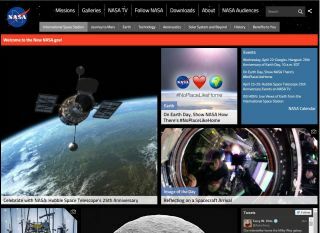 The new look of www.nasa.gov is heavy on images, friendilier to mobile devices and encourages sharing on social media. Houston, we have a new website. Today, NASA launched a major redesign of their homepage, and the new product puts heavy emphasis on images and connection with social media. The new look of www.nasa.gov is a striking departure from the old design — most noticeable is the overwhelming presence of images, which take up more than half of the front page. The website's overall organization has also undergone some changes, and there are some modifications to the categories, topics and sections. "Based on extensive user feedback and testing, we've modernized NASA.gov to work across all devices and screen sizes, eliminate visual clutter, and put the focus on the continuous flow of news updates, images and videos we know you're looking for," NASA said in a statement. If users get lost while navigating the new website, they'll stumble upon a unique 404 page that reads, "The cosmic object you are looking for has disappeared beyond the event horizon." While the new website appears overwhelmed with photos and videos compared to the old design, NASA's statement about the redesign states that "one of the top user complaints about the site has been the difficulty in navigating the visual clutter." "The new design has far fewer links per page, and the focal point is a dynamic feed of content, arranged largely in reverse chronological order, and incorporating feature stories, images and videos," the statement said. In addition, the new site will link related topics and stories on the same page. "Once you've clicked on a piece of content, we present an 'infinite scroll' of related content. As long as you scroll down the page, you'll be presented with recent stories or images on that topic." The redesign also focused on making it easier for visitors to share content via social media, and making the site friendlier to different devices. NASA stated that "over 25% of our audience is now coming to the site on a phone or tablet."